Why Does Wine Not Expire? Making homemade apple wine does not require a lot of equipment or special skills. 1 Why Does Wine Not Expire? Although wine is generally prepared using grapes, you can make wine just as easily from other fruit, including apples. 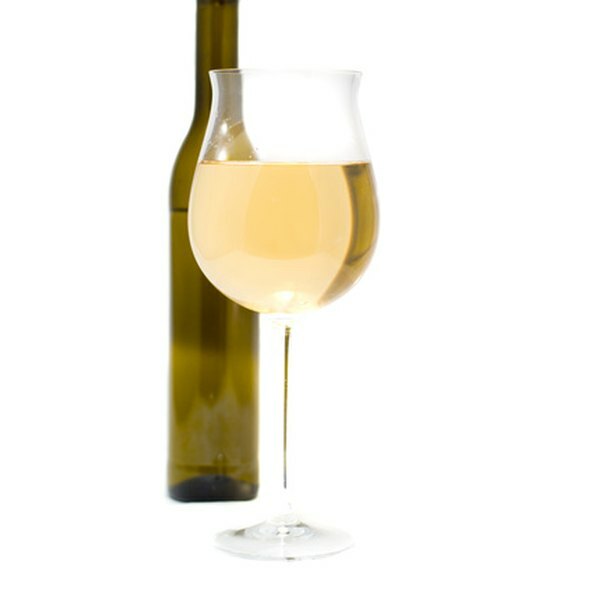 Apple wine offers an alternative flavor to that of wine made from grapes. Make apple wine at home with minimal equipment and special ingredients that you can probably buy at your local wine store. Ripen your apples by placing them in a preheated oven for a few minutes. The oven should be preheated to a temperature of approximately 350 degrees Fahrenheit. Take the apples out and place them in a bucket. Leave them there until the skin is brown and the fruit is soft. Remove the apple core, and blend the apples in a regular kitchen food processor until they're mushy. Place the blended apples in a fermenting container. Pour water into the container so that it barely covers all of the apples -- adding too much will water down your wine. Add 2 tsp. of tea to the fermenting container for every gallon of wine that you are making. This ensures that your wine won't spoil quickly. Add 1 kg -- 2.2. lbs. -- of sugar for each gallon of wine, mixing it in a little at a time. Warm up some of the juice from the apples in a small saucepan and pour in the wine yeast. Pour the mixture into the fermenting container. The yeast is necessary to change the sugar that you've added to alcohol. You want the right balance of sugar and yeast: too much yeast means that you'll end up with a dry wine; too much sugar means that your wine will be too sweet. Finding the right balance between the two will take some experimentation on your part and a few batches of wine. Cover the fermenting container with its lid and place it in a room that is at room temperature -- about 70 degrees Fahrenheit. Leave the apples to ferment for four to seven days, checking the wine with a hydrometer each day, if you have one handy. A hydrometer tests the wine for sugar content and tells you whether you need to add sugar. 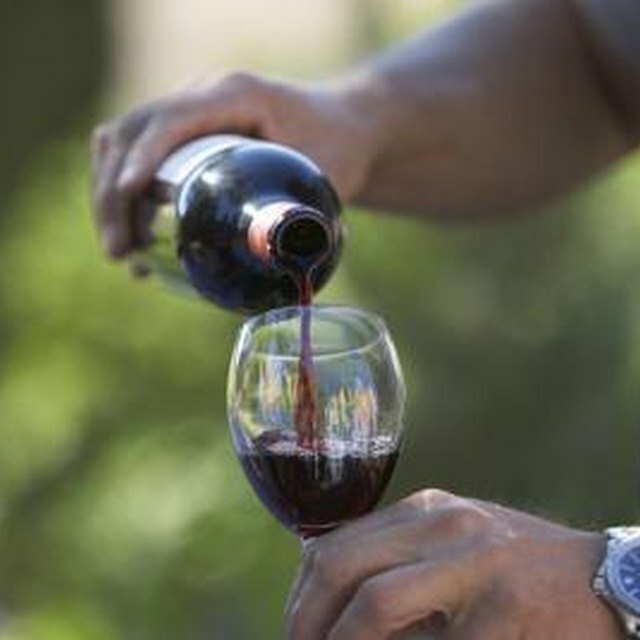 A reading of 990 g means that the wine will be a dry wine and you may need to add sugar; whereas, a reading of 1,020 g means that your wine will be sweet. Place a large pot or container on the floor next to the fermenting container. Using a large piece of cheese cloth or a sieve, strain the liquid from the fermenting container into the second container. Using a funnel, pour the liquid into fermenting jars. Seal the jar using a cork with a hole running through the center. Wait for the cloudiness produced by the yeast to settle. Afterward, strain the liquid, making sure that no yeast sediment remains, and pour it into a second jar. It's best to allow this process to take a few months, although it can be done in less time. Bottle the wine and drink. Hannah Ardeb has been writing and editing since 2008. She has written and ghostwritten content for online platforms including company blogs, marketing blogs and copy for health products and e-commerce websites. Ardeb studies English literature at Bar Ilan University. Can You Make Cider From Cooking Apples? Does Yeast Turn Juice to Alcohol?